Giang Bui is Exchange Traded Products Listings Manager at Bats Global Markets. Ms. Bui is responsible for supporting the company's listings business, developing strategy, working with issuers to list their products and overseeing market quality incentive programs. Prior to joining Bats, Ms. Bui was an Associate on the Global Index and Exchange Traded Products team, where she played a key role in the development and marketing of new and innovative indexes. 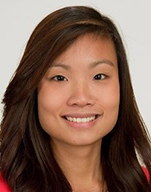 Ms. Bui graduated with a Bachelor of Arts in Mathematics and Economics from Lafayette College.